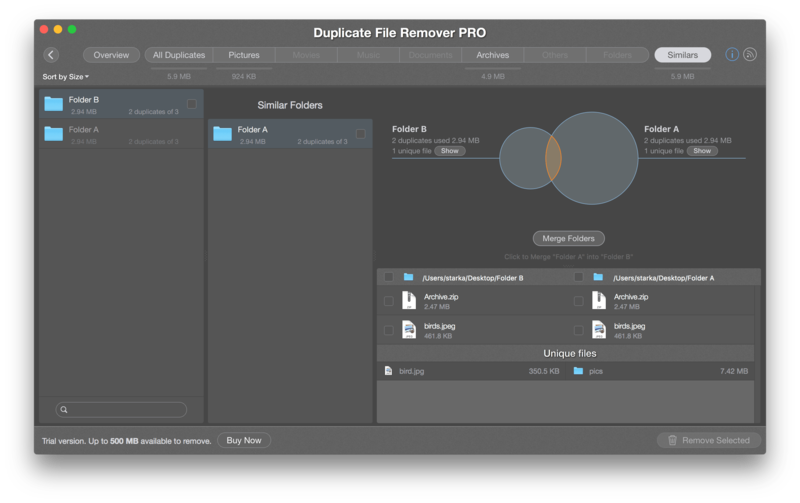 Duplicate File Remover Pro allows users to find not only duplicate files and folders but similar folders as well. 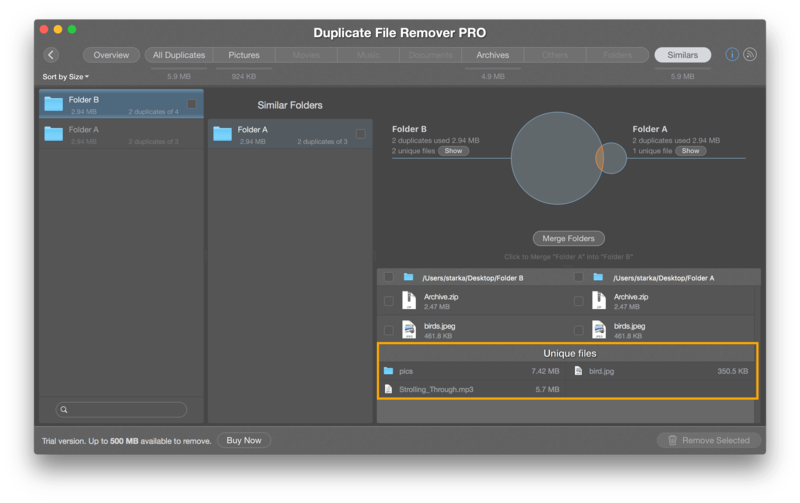 What do we mean by calling folders “similar”? Such folders are not completely identical, containing as duplicate files as unique. For example, you downloaded all your precious photos from iPhone & iPad to Folder “X”. Several weeks after you downloaded again your photos to Folders “Y”, but only from iPad. So, Y-folder contains iPad photos from “X” and other pictures that took during 3 weeks. 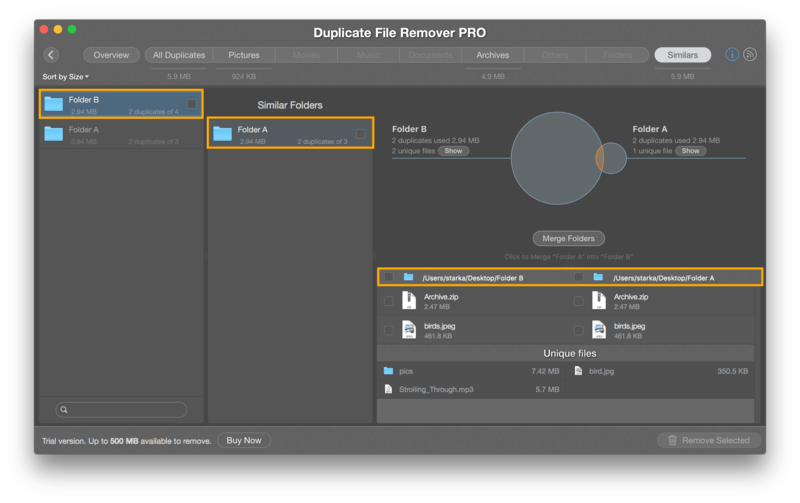 X and Y are not identical, but they have similar files. Here you can see how much space your Similars take. List on a left side contains all folders that have other similar folders. The right list contains similar folders only for a currently selected one. Note: one folder could be similar to multiple folders at once. Don’t worry, Duplicate Expert knows about anyone. 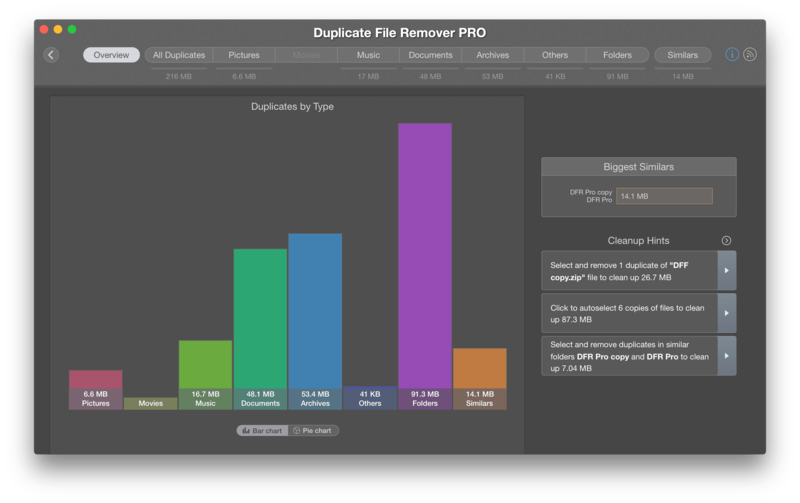 The last chart shows similar folders representation, information about duplicate and unique files from folders you selected. In this example, archives folder is bigger than photo sea, the folders have 2 common duplicate files, archives contains 22 unique files, photo sea folder contains 19 unique files. Table on a bottom contains list of duplicate and unique files. Folder names and paths are displayed in the header of the table. Select unneeded files and click Remove selected to delete duplicates in similar folders. Note: When some files selected for removal, a red badge with a number of selected files will be displayed. 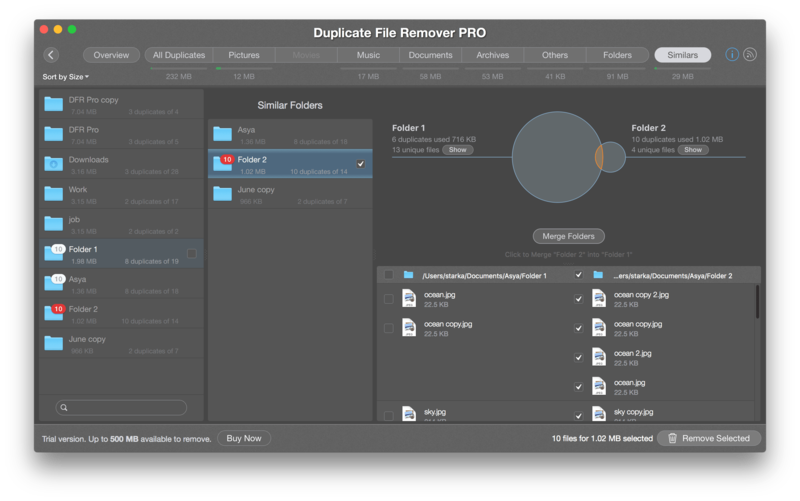 Otherwise, the grey badge shows a number of selected files in the folder’s duplicate. Red means how many files selected for removal in the current folder, grey stands for a number of selected files for removal in duplicate’s folder.